You can use an Amazon EFS file system in one Amazon VPC at a time. That is, you create mount targets in a VPC for your file system, and use those mount targets to provide access to the file system. A VPC peering connection is a networking connection between two VPCs that enables you to route traffic between them using private Internet Protocol version 4 (IPv4) or Internet Protocol version 6 (IPv6) addresses. For more information on how Amazon EFS works with VPC peering, see Mounting EFS File Systems from Another Account or VPC. 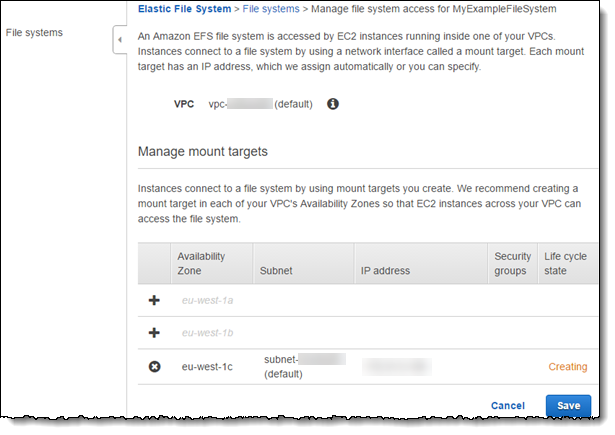 To access the file system from EC2 instances in another VPC, you must first delete the current mount targets and then create new mount targets. The console displays the Manage File System Access page with a list of mount targets you created for the file system in a VPC. The following illustration shows a file system that has three mount targets, one in each Availability Zones. To change the VPC, select another VPC from the VPC list. The console clears all of the mount target information and lists only the Availability Zone. Choose the security groups that you want to associate. For inter-region VPC peering, the security groups you choose need to have a rule that allows inbound traffic over NFS (port 2049) from your other VPC or VPCs. For information about security groups, see Amazon EC2 Security Groups in the Amazon EC2 User Guide for Linux Instances. The console first deletes the mount targets from the previous VPC and then creates new mount targets in the new VPC that you selected. To use a file system in another VPC, you must first delete any mount targets you previously created in a VPC and then create new mount targets in another VPC. For example AWS CLI commands, see Creating or Deleting Mount Targets in a VPC.